Many factors influence whether or not someone will perform a pro-environmental action. Because more than one factor is often operating at a time, it can be difficult to establish how programs can best work to positively change behaviour. Also, because each action occurs in its own context, place and time, what works to influence behaviour change in a certain situation may not necessarily work in another. The diagram below shows 8 different influences supported by social science research outcomes. It may be helpful to think of these separate influences as ‘gases’ that combine to fill a space, resulting in a unique ‘mixture’ or behaviour. A greater amount of one type of gas (or influence) may move into the space, whereas others can be in smaller amounts or non-existent. These influences may operate with or without people being consciously aware of them. For example, people are less likely to litter in a public place that looks clean, safe and well cared for, even when they are not consciously aware of it. People may however, make a conscious choice to litter because there is no bin located conveniently nearby. To explain how these influences interact with each other to predict behaviour, social scientists have developed explanatory theories and models (What are the Best Theories of Behaviour Change?). Some influences have been the subject of a great deal of research whereas others have not. No single model can account for all the influences, but preparatory research on your program’s target group should establish which influences create points from which you can best leverage change. The processes by which we perceive, recognise, judge, reason or imagine things. PERCEIVED CONTROL: The degree to which a person believes that they have the capacity to make a change to benefit the environment - physical skills, money, knowledge, etc. Example: I don’t know how to install a low flow showerhead. Also, the degree to which someone believes that a situation is controllable. Example: There’s no point doing anything about climate change - what I do won’t make any difference. EASY TO IMAGINE OR RECALL: Images that are vivid or easy to imagine or recall are more available to memory and are assigned more importance. If you can think of it, it must be important. If it evokes a strong feeling it must be important. Example: I will reduce my energy use because it’s important (the consequences of climate change look frightening). Note that evoking extremely strong feelings can backfire. Example: I won’t even think about climate change (because it makes me feel scared and helpless). ATTRIBUTION: People’s willingness to restore or prevent damage can be driven by who they attribute the cause of the damage to. Example: I think reductions in carbon emissions should be driven by developed countries because they put the pollution there in the first place. DISCOUNTING: A desired result in the future (clean environment) is perceived as less valuable than the result in the present (not having to make an effort to do environmentally friendly actions). Example: I want to use my car less but will wait until climate change is really a problem. It’s not here and not now. INCORRECT BELIEFS: Beliefs about environmental issues which are wrong. Example: Cigarette butts will quickly break down in the environment. IGNORANCE: People don’t understand the problem or its consequences. Example: A person doesn’t fully understand climate change or its consequences because it’s too complex. Everyone has multiple goals, desires or preferences, some of which may outweigh others in importance or urgency. Example: I’d prefer the kids walked to school but I think they are likely to be safer if I drive them. In this case, the desire to keep children safe outweighs the desire to reduce energy use, even though both preferences may be strongly held. Non human features of the environment affect people’s behaviour. If a resource is scarce or there is uncertainty about how much is available, or a resource is difficult to extract then people tend to use less of it. Examples: water in a drought, metals difficult to locate or mine. Features of a person’s immediate environment can also affect their desire to do a pro-environmental action. Example: People are less likely to litter a public place that looks clean, safe and well cared for. It may also affect their ability to actually do a pro-environmental action. Example: The bin is too high for children to reach or too far away from where it’s needed. Physical features may also influence behaviour in a less direct way, acting as strong mediators for other influences like social norms. Examples: If people think others are using water in a drought then they will too; in a public place, lots of unwanted graffiti gives the impression you don’t need to care for this place because others don’t seem to. The rules that people use to know what values, beliefs, attitudes and behaviours may be socially appropriate or inappropriate. DESCRIPTIVE NORMS: Perception about how widespread a behaviour is among others. Example: Everyone puts their recycling bin out so I will too. 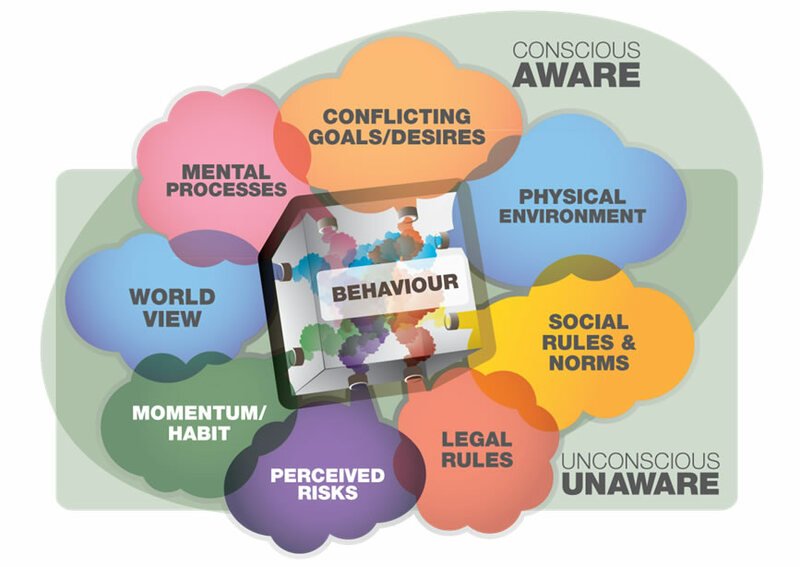 INJUNCTIVE NORMS: Perception about what is acceptable or unacceptable social behaviour. Example: I won’t plant a large new lawn because my neighbours won’t approve of me wasting water. PERSONAL NORMS: Standards of behaviour people set for themselves. Example: I bucket water from the shower to the garden because it’s personally important for me to do my bit for the environment. ATTACHMENT TO A PLACE or SENSE OF BELONGING are likely to be mediating factors, that is, norms are more likely to be activated when people attach certain positive meanings to a place. Example: I would never litter in my neighbourhood park. In fact I often pick up other’s litter there. Rules that the community recognises as regulating its member’s actions and which may be enforced by the use of penalties. Examples: Water restrictions, local littering laws, wildlife hunting laws, rights to use land and water, tax incentives, carbon trading, land tenure, harvesting and hunting limits. Laws can help create powerful positive social expectations about behaviour. People vary in response to how consistently laws are enforced and also how much legislative interference they will tolerate. People make judgements about the likely risks associated with a behaviour. SOCIAL: Will other people think badly of me? Example: People might think badly of me if I wear second hand clothes. TEMPORAL: Will it take too much time? Example: It will take too long to get to work by bus so I’ll take the car. PHYSICAL: Will I come to some physical harm? Example: I don’t want to touch the dirty bin, it looks germ ridden. FUNCTIONAL: Will it really work? Example: Will I still get proper performance from an electric car? FINANCIAL: Will it cost too much? Example: Is it worth the up front cost to buy solar panels? Behaviour that is highly reinforced, repeated lots of times and therefore may be resistant to change. Examples: Using the car instead of public transport, using lots of water during well established bathroom routines. A well entrenched habit may be more likely to change if it’s easy and the downside is small. Example: Turning the tap off while brushing your teeth may be easier than having a shorter shower where you may be giving up a pleasant sensation, warmth or personal time out. Groups in the community share certain ways of looking at the world. Shared values and feelings predispose them to pay attention to some things and ignore others. They may therefore behave differently. I have a right to as much water as I want so I water my garden when I want to, even during restrictions (individualism). People in the future have an equal right to resources. I will reduce my energy use wherever I can (egalitarianism). Mother nature will take its course; God will intervene; technical innovations will save us from climate change so I don’t need to act (fatalism). For simplicity although these 8 influences are presented as separate, they often overlap, both conceptually and in practice. Although it is not possible to know exactly which influences are operating all the time, it is possible to identify the ones that are most likely to operate on your identified target group in the particular set of circumstances in which the behaviour occurs. Well articulated program objectives and preparatory research into your target group should guide your actions.